In these still early days in the 2019 legislative session, state legislative committees have explored issues central to our concerning with expanding economic opportunity. Let’s take a minute to catch up on them. The most noted divergence concerned the capital gains income tax. On one side, Washington Policy Center Government Reform Director Jason Mercier argued that the tax is unconstitutional and volatile, while Washington State Budget & Policy Center Associate Director of Fiscal Policy Andy Nicholas said it would help make the state tax structure more progressive. The hearing brought out an often-overlooked aspect of Washington’s tax structure that tilt the system toward the regressive side of the scale. Mercier highlighted several excise taxes that are some of the highest in the country. Tobacco tax, $3.02 per pack (eighth). 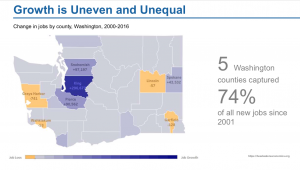 And we’d be remiss if we did not again highlight the Washington Research Council’s excellent overview of the state tax structure and its debunking of a prominent study claiming Washington has the most regressive tax system in the country. For insight as to the perspectives presented by the two think tanks, visit the websites of the Washington State Budget and Policy Center and the Washington Policy Center. Jason Mercier also helpfully posted links to the various segments of his presentation and handouts. The committee also reviewed a presentation by Headwaters Economics, a Montana-based research group. We’ve embedded the relevant slide from the presentation by Mark Haggerty of Headwaters Economics. Several approaches to improving rural economic opportunity were considered. …state senators have proposed a variety of bills to boost rural economic development, including a job tax credit and rural development and opportunity zone funds. Those proposals were well received during a Jan. 24 public hearing of the Senate Financial Institutions, Economic Development & Trade Committee. However, some testifiers stressed the need for long-term solutions to address the regional inequity. A similar outcome is the objective for SB 5423, sponsored by Sen. Guy Palumbo (D-1) and cosponsored by 13 Republicans and Democrats. The bill encourages job growth by creating rural development and opportunity zone funds. Investments into those funds would be eligible for insurance premium tax credits or the B&O tax. As written, 30 out of 39 counties would be considered a qualified area for the tax credit. It’s early days and we’ve not evaluated the proposals. The problem of struggling rural economies, however, is real and of concern. For background, we’d refer you to our earlier posts on our state’s urban-rural divide and its legislative implications.